(Nanowerk News) The discovery of "topologically protected" electrical conductivity on the surface of some materials whose bulk interior acts as an insulator was among the most sensational advances in the last decade of condensed matter physics—with predictions of numerous unusual electronic states and new potential applications. But many of these predicted phenomena have yet to be observed. Now, a new atomic-scale study of the surface properties of one of these ferromagnetic topological insulators reveals that these materials may not be what they had seemed. The research – conducted at the U.S. Department of Energy's Brookhaven National Laboratory and published in the Early Edition of the Proceedings of the National Academy of Sciences ("Imaging Dirac-mass disorder from magnetic dopant-atoms in the ferromagnetic topological insulator Crx(Bi0.1Sb0.9)2-xTe3") – revealed extreme disorder in a fundamental property of the surface electrons known as the "Dirac mass." Like the mass imparted to fundamental particles by their interactions with the recently confirmed Higgs field, Dirac mass results from surface particles' interactions with magnetic fields. These fields are created by the presence of magnetic atoms substituted into the material's crystal lattice to convert it into a ferromagnetic topological insulator. 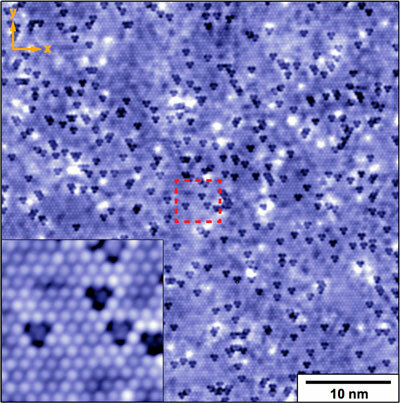 Topographic image of chromium dopant-atom locations at the topological insulator surface. "What we have discovered is that the Dirac mass is extremely disordered at the nanoscale, which was completely unanticipated," said J.C. Séamus Davis, a senior physicist at Brookhaven Lab and a professor at Cornell University and St. Andrew's University in Scotland, who led the research. "The analogous situation in elementary particles would be if the Higgs field was random throughout space so that the electron mass (and the mass of a car or a person) was randomly different at every location. It would be an extremely chaotic universe!" In the ferromagnetic topological insulators, Davis said, the chaos eventually destroys the exotic surface state. "Our findings explain why many of the electronic phenomena expected to be present in ferromagnetic topological insulators are in fact suppressed by the very atoms that generate this state, and offer insight into the true atomic-scale mechanism by which the observed properties arise," Davis said. "This new understanding will likely result in revisions of the basic research directions in this field." Under Davis' guidance, Brookhaven Lab postdoctoral fellows Inhee Lee and Chung Koo Kim studied nearly perfect ferromagnetic topological insulator crystals grown by Brookhaven physicist Genda Gu. They used a spectroscopic imaging, scanning tunneling microscope (SI-STM) designed and built by Davis at Brookhaven to scan the surface of these crystals atom-by-atom. This tool has the precision to simultaneously reveal the positions of the magnetic dopant atoms and the resulting Dirac mass. Prior to this work, scientists had assumed that these magnetic dopant atoms were not detrimental to the topological surface states. But no one had directly studied how the spatial arrangements of the magnetic dopant atoms at the atomic scale influenced the Dirac-mass because there were no reliable techniques to do so, until now. The new atom-by-atom SI-STM data revealed not only the intense nanoscale disorder in the Dirac mass, but also showed that this disorder is directly related to fluctuations in the density of the magnetic dopant atoms on different parts of the crystal surface. In the paper, the scientists also provide the first direct evidence for the actual mechanism of how surface ferromagnetism arises in a topological insulator, and determine directly the strength of the surface-state magnetic-dopant interactions. "The Dirac-mass 'gapmap' technique introduced here reveals radically new perspectives on the physics of ferromagnetic topological insulators," Davis said. "The key realization from these discoveries—aside from a clear and direct picture of what is going on at the atomic scale—is that, in ferromagnetic topological insulators dominated by this magnetic-dopant atom phenomena, many of the exotic and potentially valuable phenomena expected for these materials are actually being quantum mechanically short circuited by the random variations of Dirac mass," he said. Of course, there may still be a way to achieve all the exotic physics expected of ferromagnetic topological insulators—if scientists can develop ways to control the dopant-induced Dirac-mass gap disorder. Hence the idea of a whole new research direction for this field.